I can’t believe that a month ago I was in France celebrating my friends wedding. Neither can I believe how impressed I was with my driving! I always used to try get out off driving in France. The French are crazy drivers. Indicators, why bother, they’re just fancy flashing decorative lights, they bump cars parking without a blink of an eye and it’s the only country I know of, where there are signs approaching roundabouts saying you do not have the right of way. I learnt to drive in the UK and I’ll be honest, when I go back to visit, I’m not that confident driving. I’ve spent more time cycling on the right that I did driving on the left. I’d got used to the gear stick being on my right. Going to my friends wedding I had no choice but to drive. Public transport wasn’t an option (buses stop at 8pm! ), so I had to get on with it. It didn’t help my hire car only had 6km on the clock either. Brand spanking new. Not that much pressure not to prang it! But, I surprised myself. I had no problems, no fears, negotiated out of tight parking spots I’d have otherwise have flustered about. I may have accidentally drove in the bus lane for a few minutes and I have have not paid for parking once as I didn’t think you had to, because we always went there on the motorbike and you don’t have to pay parking with a motorbike. Maybe because I knew the area, maybe because it was about time I’d learnt to drive! And you know what, I had fun! 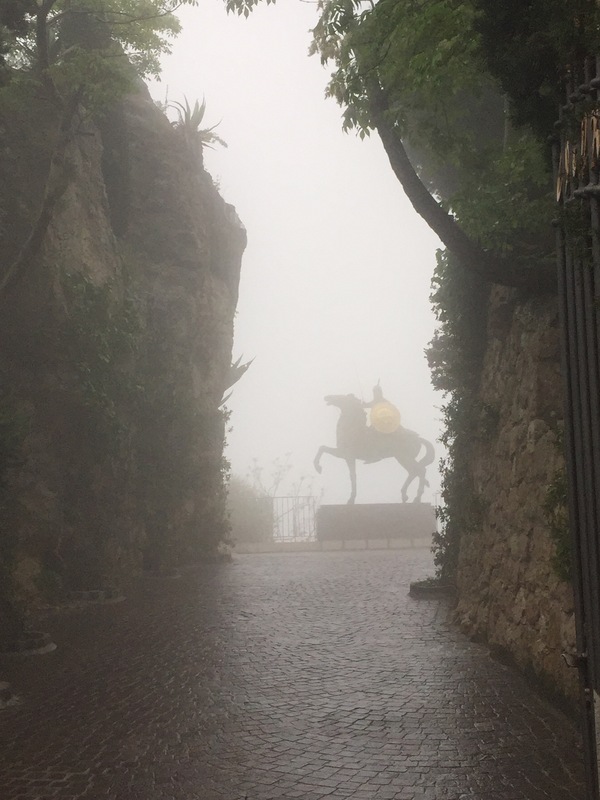 Eze is nestled high on a rocky out croft overlooking the Mediterranean Sea between Monaco and Nice. The drive from Nice along the sea road is amazing. I chose the sea road rather than the motorway not only because I’m not that condifdent on motorways, but because the views are spectacular. Especially driving above the port/marina by Cap d’Ail. 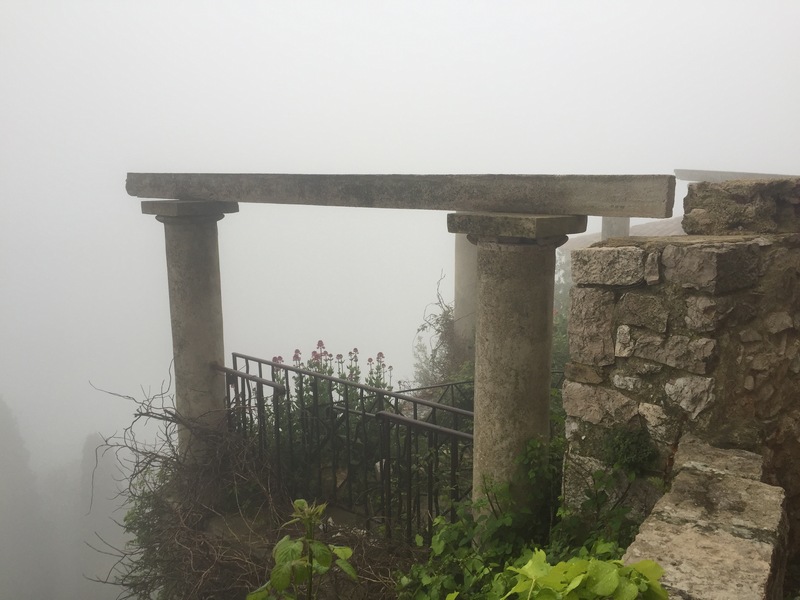 On any given day the views from Eze overlook the sea, but the day I went, I was so high up I was driving in a rain cloud! Crossing the viaduct approaching the village I could just see in front of the car. Sadly due to the rain cloud sea views were non existent. But that didn’t distract from it’s charm. The whole village was blanketed in cloud which only added to it’s mystical medieval-ness. Eze has a rich history and has exchanged many hands, among them, Phoenician, Greek, Roman, Moorish and French. It was under the principality of Monaco so probably at one point Italian too. It’s home to the 5 star, Relais et Chateau, Chateau de la Chèvre d’Or or Golden Goat Chateau. One day I’ll make it in time to visit the le Jardin Exotique located at the top of the village full of mediterranean plants. Every time I/we’ve visited by the time we’ve made it to the top of the village, it’s closed. Next time! Just next door to the garden on a non cloudy day you can see the Golden Goat overlooking the Sea. Entrance to the Chateau de la Chèvre d’Or. Fragonard, the Perfumer. Their main shops and museum are located in Grasse, however I always preferred visiting Eze to Grasse when I lived in the area. The same view, taken about 1.5 years apart! Turquoise waters along sea road via the Promenade des Anglais, Nice. That’s how confident I was driving. Enough to wind down the window and take photos. Stopped at traffic lights of course! Have you ever been to the Cote Azur? What’s your favourite part of it? I always preferred visiting the towns and villages on the way to Italy. Thank you, I’ve only visited a few European countries. So many places to see! The architecture of the buildings is just gorgeous. Love the pathways as well. The weather may not have cooperated but the views were still stunning! Eze’s is full of little alleyways twisting here and there. Every turn was another photo op! It made a change being gloomy. It added to the place and obviously less people photobombing! I’ve never been to the south of France, but it’s on my list! It’s too bad you didn’t get a nice sunny day for your pictures, but I can still tell the views were gorgeous. It made a change being drizzly. It added to the place! Canada’s on my list of one day places to visits. Probably have to keep on day dreaming!